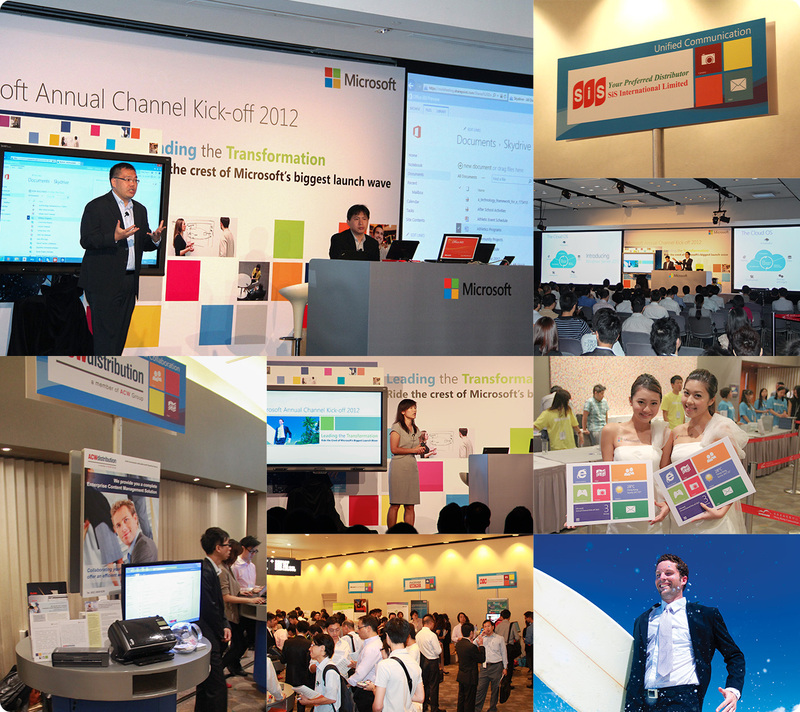 Microsoft Annual Channel Kick-off is an annual event to recognize and reward their partners for wholehearted efforts and enormous support. This year's event is transformed into a celebration party at Hong Kong Convention and Exhibition Centre. With exciting soon-to-be released technologies, Microsoft will continue to offer the latest industry resources to foster mutual success. Microsoft Annual Channel Kick-off celebration party kick-started with a keynote to share the latest Microsoft technologies, including Windows, SQL Server, Windows Server, Exchange Server, Office, Office Communicator and SharePoint, was then showcased at various checkpoints with product demonstrations. The graphic design similar with Windows 8 user interface style, using a large area of color, simple icons and refreshing layout to cause an attention. 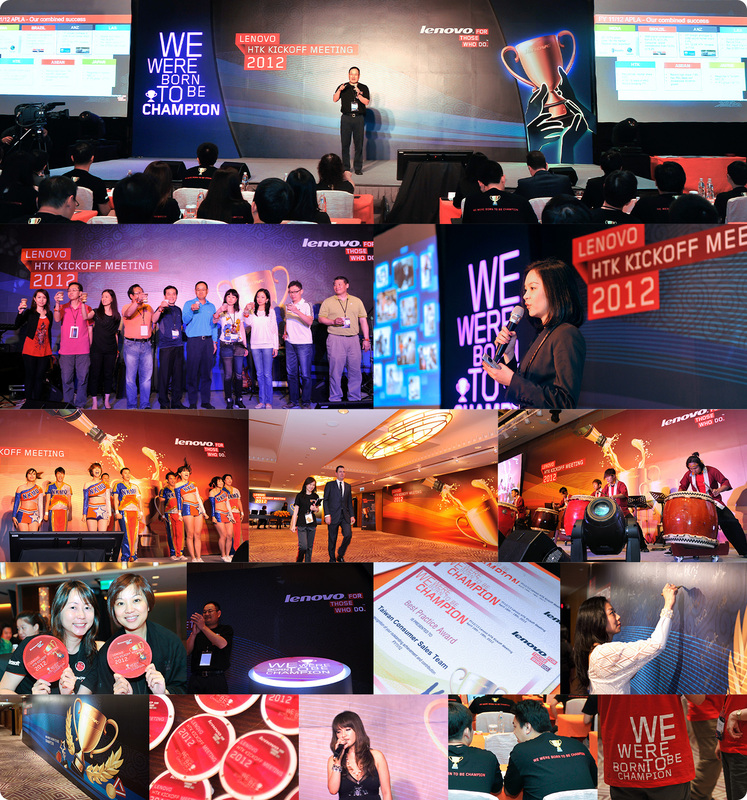 In last year, Lenovo group held its annual kickoff meeting and gala dinner in Taiwan, Lenovo got a brilliant achievements in the past year, and became the world's No.1 PC manufacturers and encouraged by morale. Lenovo group announced that they will launch a new strategy and four terminal products including Smartphone, tablet PC, personal computer and Smart TV. In order to coordinate their brilliant achievements, the theme of Kickoff meeting is "we were born to be champion". Using a rewarded statement to show the excitement of their achievements last year. The main visual using a golden trophy and champagne for gaiety celebration. The Lenovo Kickoff meeting completely in passion and entertaining except an array of celebration ceremony. The gala dinner with wonderful programs such as a guest speech, sing and dance performances. In addition percussion and symphony pushed the atmosphere to the top. Microsoft Tech•Days are the largest demonstration of Microsoft. This is the ideal platform for infrastructure professionals, developers and architects. They offer all the news related to SQL Server, System Center, Exchange, Lync, Office, Visual Studio and numerous sessions for Windows 7, Windows Phone, Windows Azure, and so on. 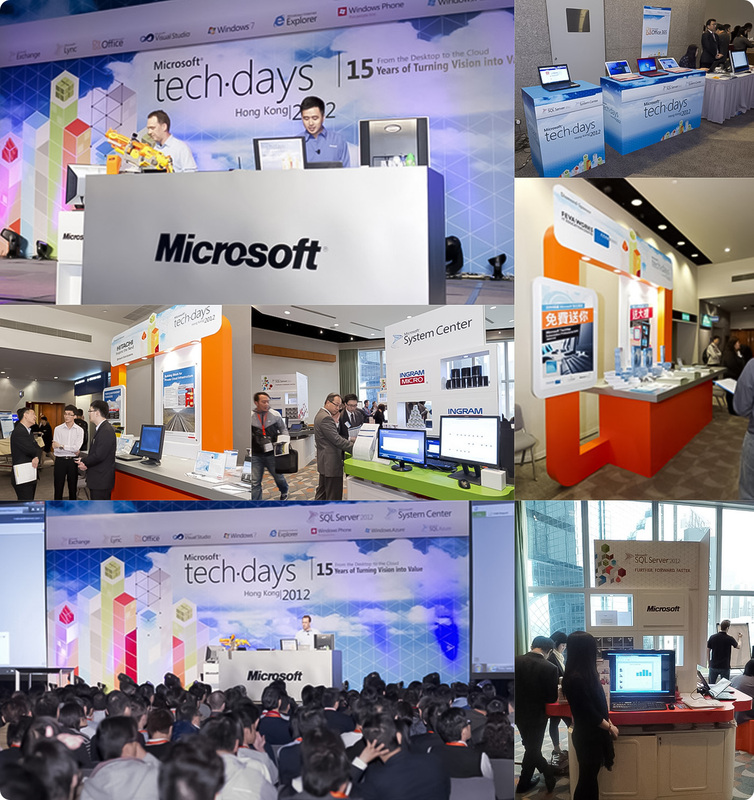 Hundreds of technology professionals in Hong Kong networked with peers and experts, while diving deep into Microsoft technologies, including key topics related to the emerging prominence of Cloud and mobile computing in today’s IT environment. The shapes and configurations on grids that represent the building blocks for the SQL Server 2012 visual language have been constructed to provide a solid foundation on which to build on. The idea is a slow build that develops into fully formed colored blocks and icons. Lenovo Channel Kickoff is an important event of Lenovo Group, they are rewarded and celebrated at HKCEC this year, they invited the guest and their staffs to review the last year of Lenovo performance with banquet. Lenovo announced new strategic planning deployment in coming year to encourages their staff. The highlights including showcase of legacy ThinkPad models from the last twenty years. They introduce the TrackPoint, Rollcage, Active Protection System, Silent Owl Blade, Sprill-Resistant Keyboard, Integrated fingerprint reader etc. The ThindPad creative is not unconstrained, that is a sensitive observation and inspiration in living to create the suitable design. 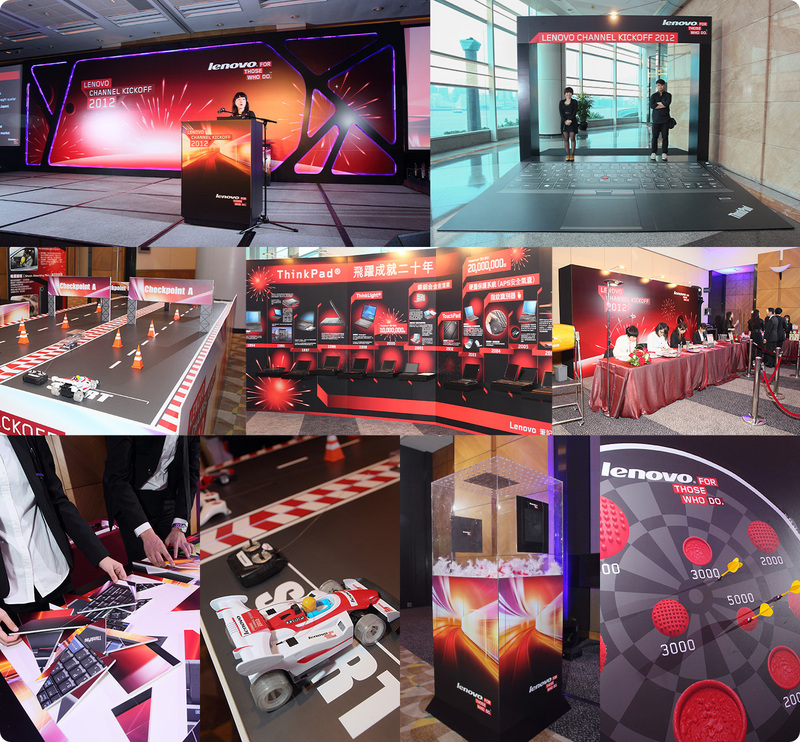 Many of games outside the auditorium including the ThindPad puzzle, TrackPoint dart, ThinkPad formula, finger-print matching, flying feathers, Q&A and lucky draw. They let people to strengthen the development and to understand the ThinkPad design history. The theme concept is across the space and timeline, from front door design and spacecraft module backdrop also represent the evolution process of Lenovo computer in the past twenty years. Paperworld as the Asia's largest purchasing platform, attracted over thousands of buyers from all various countries to come and visit. As the leader of paper shredder industry, Comet group not only plays a big role as the major export base of paper shredder and attendance machine in China, but also he is the most powerful toner manufacturer in China. The booths design with modern and corporate image, however, comfortable space design won worldwide customers with a lot of order. Successfully held for 6 editions since 2004, China International SME Fair (CISMEF) is held each September in Guangzhou, exhibitors come from various industries including electronics, household appliances, machine-making, textiles and garments, food and beverage, pharmaceuticals, biotechnology, building materials, furniture, toys and gifts, cases, bags, headwear and footwear, etc. It is the largest ever exhibition in China for SMEs to display, exchange, trade and cooperate. The Macao Trade and Investment Promotion Institute (IPIM) is a non-profit organization, which is designated to promote the trade and investment activities of the territory. IPIM's mainly to provide trade, economic, statistical, general information and market analysis to assist clients in exploring the market and the development of their business. To organize, co-organize exhibitions and other promotional events locally, to participate in such events held outside Macao and to sponsor local enterprises participation in such events, as a way to create trade opportunities. Booth design in special modeling, with open mode design completely present intensive dimension, harmony color tone, fashionable lighting and decoration to pair with overall environment, a lot of green decorate design is one of the characteristics. 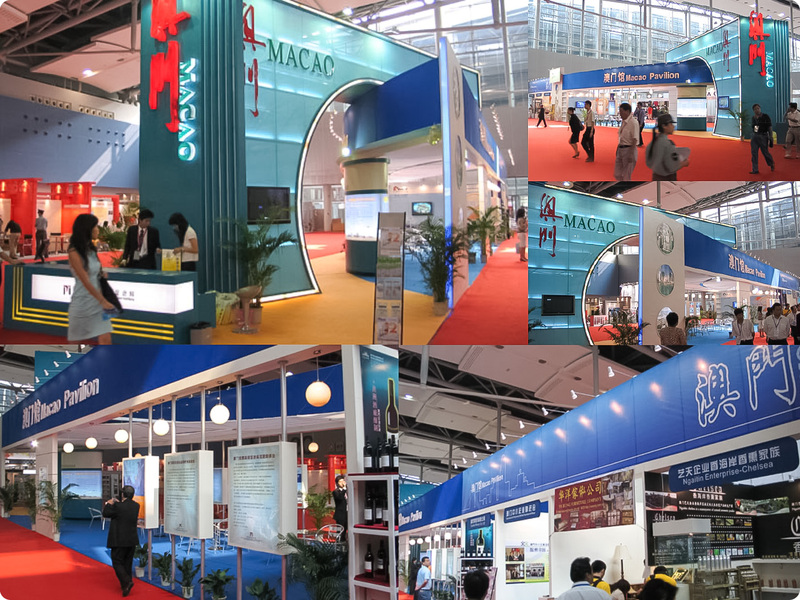 In addition main area to introduce Macao trade and investment environment and the other outside has many shops for product promotion and marketing purposes. Sponsored by China construction department and presented by Chinese architectural culture centre. 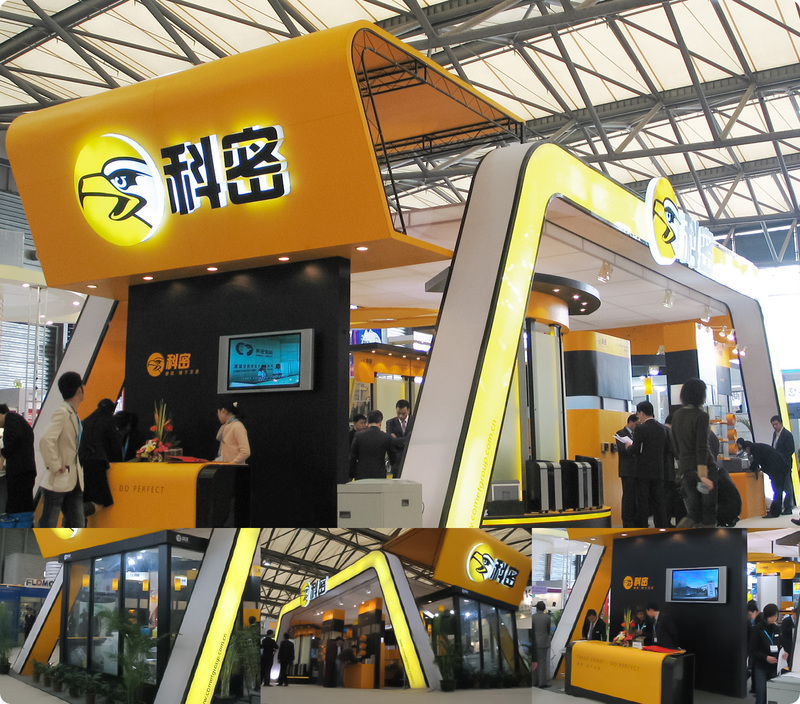 Held in Beijing every year, it is a high-grade construction industry and new product show trading events. The show aim to promote technology and enhance overall level of construction industry, and also provides new opportunities and space for the construction enterprise development. Focus on wall glass technology and equipment, construction energy save, waterproof insulation and architectural coating, construction decoration and green household, and property development typical cases studies and dynamic property etc. TOA Group was established to produce a complete range of paints to suit all applications. The facility is the largest and most modern of its kind in Southeast Asia. The products include High performance architectural coatings, High performance protective coatings, Marine system coatings, Wood coatings, Construction chemicals, computerized color mixing machines, Hardware products etc. The booth in streamline design, six regions respectively, which there are company introduction area, product display area, color center, customer service area etc, and main color tone in TOA Group blue, outstanding the corporate identity. China Import and Export Fair are also renowned as the Canton Fair. It is held biannually in Guangzhou every spring and autumn, The Fair is the highest level, the largest scale, the most complete in exhibit variety, the broadest distribution of overseas buyers and the greatest business turnover in China. More than twenty thousand of enterprises with good credibility and sound financial capabilities take part in the Fair. Sentai Electrical Apparatus Factory is one leading manufacturer and exporter of low voltage electrical products and materials in China. The higher quality products and better services satisfy the customers all over the world, they have established good business relationship with hundreds customers from more than 70 different countries and regions in the world. Since 1998, Sentai Electrical Apparatus Factory joined the Canton fair and using this chance to promote the corporate philosophy. Build up the public image, going tactic of trademark and enhance huge success. 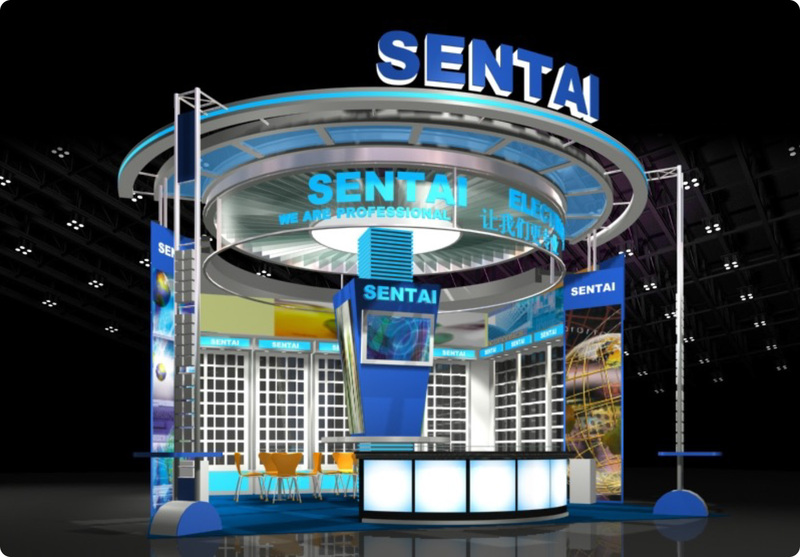 Booth design modeling combined with Sentai philosophy and technology, in addition display the products and business information, innovative spaceship decoration design is full of contemporary style, transparent material and lighting effect to increase atmosphere. China International SME Fair (CISMEF) is held each September in Guangzhou, exhibitors come from various industries including electronics, household appliances, machine-making, textiles and garments, food and beverage, pharmaceuticals, biotechnology, building materials, furniture, toys and gifts, cases, bags, headwear and footwear, etc. It is the largest ever exhibition in China for SMEs to display, exchange, trade and cooperate. High-Rise Plaza is residence and commercial building project, superior location, convenient transportation, modern architecture, huge building manner, known as the future CBD centre, he will become the landmark building in urban landscape. The booth outlook is base on High-Rise Plaza design, with golden lighting effect and grand bright red color, fully show the manner and positioning of High-Rise Plaza. The booth design included High-Rise Plaza introduction and meeting area, provide luxurious and comfortable environment for negotiation use.